When someone first hears the name of the red-bellied woodpecker, it doesn’t make sense. The bird has a bright red crown and nape, but where’s the red belly? Actually, there is a small pinkish tinge on the bird’s stomach, but it’s difficult to see unless you look for it with binoculars (and if it’s not covered with gray feathers). Unfortunately, the name “red-headed woodpecker” was already taken by another bird—incidentally, much rarer in northern Illinois—so ornithologists named this common, year-round bird the red-bellied woodpecker. The red-bellied woodpecker (Melanerpes carolinus) has creamy-to-white underparts, and a black-and-white, zebra-patterned back. The male’s forehead is red; the female’s is creamy white. (By contrast, the red-headed woodpecker’s entire head is blood red, and its back is solid black with white patches on the wings.) 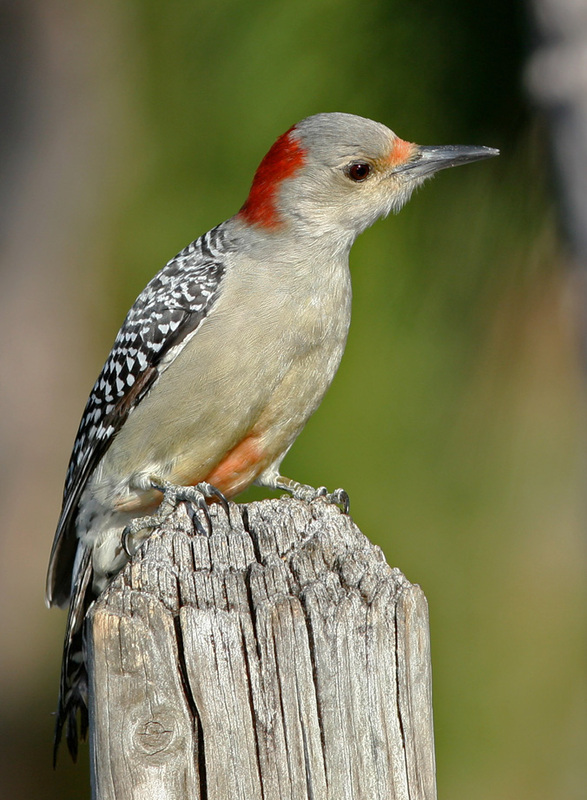 The red-bellied woodpecker’s preferred year-round habitat is woodlands, and the oak, pine hardwood, and maple forests of the eastern United States. Occasionally, it can be found in wooded suburban neighborhoods. Woodpeckers have long, barbed tongues. A woodpecker’s tongue is so long that when it is not extending it to grab a meal deep within a crevice, it pulls it in, and wraps it around the inside back wall of its skull, almost to its nostril holes. Because they can get food from deep within a tree instead of relying on what is readily available, they are well-suited to spend winter in northern Illinois, when other insect-eating birds need to move south. If a red-bellied woodpecker visits your yard, you may be able to observe some interesting behavior: the woodpecker puts a nut into the crevice of tree bark, then hits the nut with its beak to get to the yummy morsel inside. It also may store the food there to eat later. The woodpecker makes its presence known in woodlands and yards or at feeders by calling “querr” or “cherr-cherr” several times, or giving various chattering sounds. Its boisterous noises and colorful plumage add cheer to a cold winter’s day. In February or March, the male red-bellied woodpecker begins seeking places to excavate cylindrical cavities—in dead trees or dead limbs of trees—and enticing a female to mate and lay eggs, which happens in late March and early April. As with many birds, red-bellied woodpeckers will nest in the same location year after year. The male typically builds a new cavity—often in the same tree, near the old one—each season. The nest cavity is from 10 to 14 inches deep and usually built on a limb (as opposed to the trunk). The female lays four to five white eggs each season, and both parents incubate the eggs for about 12 days and take care of the nestlings, which fledge in another 24 to 27 days. Numbers of this beautiful, common bird have grown across most of its range over the past 50 years, according to the North American Breeding Bird Survey. Once most common and found mostly in central and southern Illinois, it has expanded its range northward in the state in the past century, including into northern Illinois, where it had been decidedly rare in the early twentieth century. The red-bellied woodpecker is the November bird species highlighted by the Forest Preserves of Cook County. Come #birdthepreserves with the Forest Preserves; view the list of upcoming events for free events near you. ©2016 Chicago Botanic Garden and my.chicagobotanic.org. Additional photos by Ken Thomas and Tom Friedel. Previous Previous post: Titan Arum Seedlings Shared Throughout the U.S.